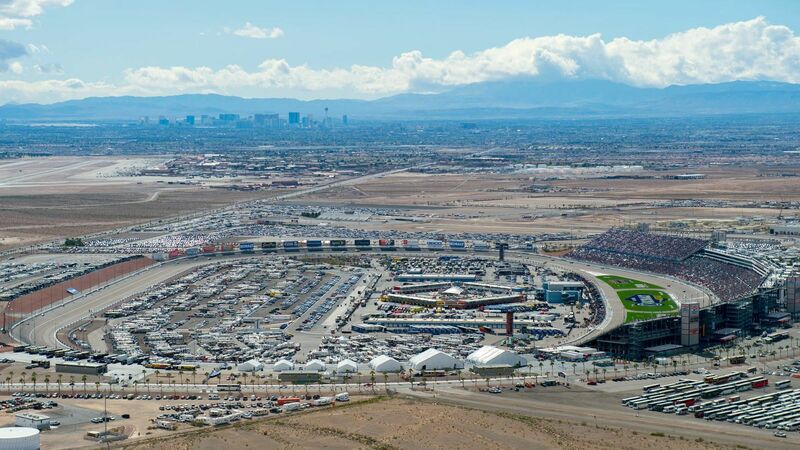 Just a few miles north of The Strip, Las Vegas Motor Speedway sits like a diamond in the desert. For race fans, it is one of the most exciting stops on the schedule. Needless to say, there is plenty in Vegas to fill up your weekend. LVMS highly recommends that guests plan on arriving early to avoid delays. If you have a parking pass for the event, please read the instructions on the back of your pass carefully, as they may differ from these general parking instructions. Please refer to our facility map for more detailed information. Follow I-15 North to Exit 54 (Speedway Blvd). Speedway is about 12 miles north of downtown Las Vegas. Alternate route is Las Vegas Boulevard North. LVMS suggests using the C.C. 215 Beltway east to I-15 North. Take I-15 North to exit 54 (Speedway Blvd). Using either of the LEFT two lanes on the exit ramp, travel straight across Speedway Blvd into Blue Lot. Follow the instructions of NHP and the parking attendants to your space. LVMS suggests using I-15 North to exit 54 (Speedway Blvd). Using either of the LEFT two lanes on the exit ramp, travel straight across Speedway Blvd into Blue Lot. Follow the instructions of NHP and the parking attendants to your space. LVMS suggests using 95 North to Las Vegas Blvd. Take Las Vegas Blvd north all the way to LVMS and use Parking Gates 5-6-7 to access Red Lot. Hint:Las Vegas Blvd typically has fewer cars on it for this event. LVMS suggest using Las Vegas Blvd. Take Las Vegas Blvd north and use Parking Gates 5-6-7 to access Red Lot. Hint:Las Vegas Blvd typically has fewer cars on it for this event. LVMS suggests using I-15 North to exit 58 (Apex) - Stay in the passing lane on I-15 north and travel past exit 54. Take a right on Las Vegas Blvd (exit 58 - Apex) and use Entry #9 for access to Yellow lot, Entry #8 for access to Blue lot, or Entry #3 for access to Brown lot. Hint - the Yellow lot and the Brown lot clear the quickest after the event. Use the passing lane all the way to Exit 54. There are 3 northbound lanes approaching LVMS on I-15, pick the one with the least amount of cars all the way to Exit 54. Once on the exit 54 ramp, use the far-left lane or the center lane for direct access into Blue Lot. Hint - Vehicles in the shoulder lane will be checked for parking passes at the end of the ramp. If you do not have a parking pass, use the center lane or left-hand lane. The best kept secret in town for arriving at LVMS. Very few cars use this road to arrive, especially early in the day. Take Las Vegas Blvd north to Entry #1 for access into Red lot or Entry #3 for access into Brown Lot. Use I-15 to exit 54, all motorcycles will be parked on asphalt in the A section of Blue lot. Enter from the rear of the lot using Wally Parks Lane and follow the signs to Motorcycle Parking. Do not attempt to enter via Speedway Blvd. Use I-15 to exit 54, all vehicles with authorized handicap plates or placards will be parked on asphalt in the Dragstrip lot. Enter from Exit 54 - behind the Blue lot and follow the signs to Handicap Parking. Do not attempt to enter via Speedway Blvd. Vehicles parked in the Blue Lot will exit out of Parking Gates 12-13-14-15 on Speedway Boulevard. All traffic will travel toward the on ramps of Interstate 15. Traffic will not be allowed to exit toward Las Vegas Boulevard. Exit the Blue Lot via Gates 12 or 13 and follow the instructions printed on the back of the Lot 7 parking pass. Traffic will be directed southbound on Las Vegas Boulevard to Craig Road and also to I-15 on Speedway Blvd. If you are parked in these two lots, traffic will be directed behind the dragstrip and merge onto Speedway Boulevard and travel toward Las Vegas Boulevard North. Traffic will be allowed to enter Interstate 15 at Exit 58. Traffic will exit onto Hollywood Boulevard and turn towardsLas Vegas Boulevard. Traffic will travel southbound o nLas Vegas Boulevard. Traffic will exit onto Las Vegas Boulevard and travel south (right turns only). Traffic will be directed southbound on Las Vegas Boulevard. Traffic will exit this gate in two (2) lanes. Both lanes will exit southbound on Las Vegas Boulevard. Both gates will remain locked for two (2) hours after the race ends. These are the gates to be used by RVs parked in the Boulevard RV Lot. Traffic will exit this gate in the left-hand lane and will be turning left on Las Vegas Boulevard (northbound). Passenger cars are not allowed to travel southbound onLas Vegas Boulevard until the last bus has departed. Traffic will exit this gate and travel north on Las Vegas Boulevard. Vehicles will not be allowed to travel southbound on Las Vegas Boulevard.